Since the past 7 weeks which would be very helpful for you to understand basics of Facebook Marketing. Lets now jump into case studies for the next few weeks we will cover different businesses that have made Facebook marketing part of their marketing strategy and made it HUGE! All of us have heard of jabong.com the e-commerce giant but DID you know that they doubled their customer acquisition and saw a 5-fold increase in app activation rates after Facebook became their lead marketing channel??? Every business that has ever been launched by any of us always has a story. It could be “Need for the product – Microsoft software”, “Vision of the Leader – Apple”, “Cheaper products – Metro” or “Create a Market – Flipkart”. Jabong.com brings stylish footwear, clothing, and accessories from around the world to men, women, and kids in India. It strives to provide quality products and a no-stress experience. Customer satisfaction is a key pillar of Jabong.com’s business and the focus of its e-commerce platform experienced buying team, agile warehouse systems, and customer care centers that ensure a broad selection of products, on-time delivery and quick resolution of any concerns. To increase transactions by acquiring more high-quality customers—those more likely to convert or make a purchase. 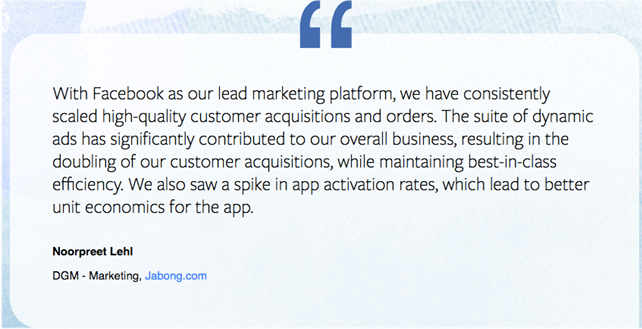 To improve app activation rates to drive traffic to the Jabong.com mobile app and control user acquisition costs. Many of us who have used online shopping to buy know that when we add some items to the cart and then don’t check out but just close the window, the next browser you open shows that exact item that you added to the cart but have not checked out. That concept is called “Retargeting”. Jabong used this concept to create Personalised Acquisition. 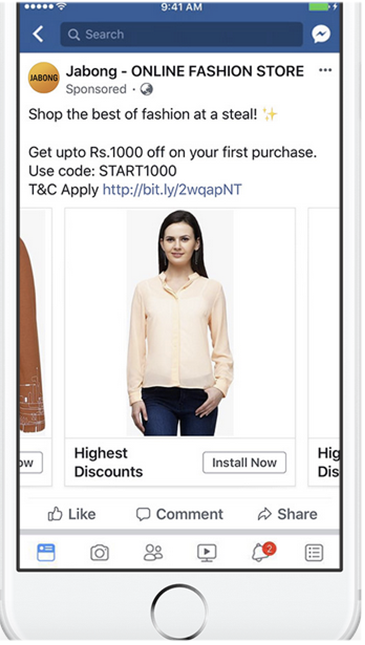 Facebook’s dynamic ads can be retargeted to potential customers by showing them products they have looked at on both Jabong.com’s website and app, allowing the brand to customize ads to every individual. This helped the company to not only reach more shoppers but also retarget them to complete the sale—across mobile and desktop. Core audience targeting helped the company reach people most likely to be interested in its products based on demographics, location, interests, and behavior. Jabong.com also created lookalike audiences based on its current customers to reach a high quality, the high purchase-making group of people who were most likely convert. The e-commerce company set up ads on-the-fly simply by uploading its product catalog. The result was an ad personalized for each shopper based on what people had browsed on the Jabong.com website or app. This led to more relevant ads that drove higher click-through rates and multiplied transactions.